What Is DA Form 2166-8? DA Form 2166-8, NCO Evaluation Report is a Non-commissioned officer (NCO) Evaluation Report used within the U.S. Army. This report is needed for a yearly evaluation of all Non-commissioned officers working within the Army and must be completed by supervising officers. 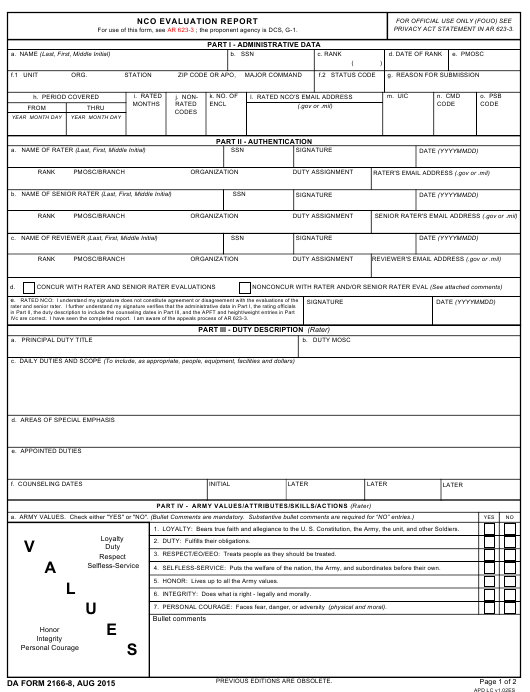 The latest version of the form - sometimes mistakenly referred to as the DD form 2166-8 - was issued in August 2015 by the Department of the Army (DA). An up-to-date fillable PDF DA Form 2166-8 is available for download below or can be found on the Army Publications Directorate (APD) website. The report is a part of a series of six forms used during NCO Evaluations. The links to all other forms can be found below. PRIVACY ACT STATEMENT IN AR 623-3. IVc are correct. I have seen the completed report. I am aware of the appeals process of AR 623-3. 1. LOYALTY: Bears true faith and allegiance to the U. S. Constitution, the Army, the unit, and other Soldiers. 2. DUTY: Fulfills their obligations. 3. RESPECT/EO/EEO: Treats people as they should be treated. 4. SELFLESS-SERVICE: Puts the welfare of the nation, the Army, and subordinates before their own. 5. HONOR: Lives up to all the Army values. 6. INTEGRITY: Does what is right - legally and morally. 7. PERSONAL COURAGE: Faces fear, danger, or adversity (physical and moral). service in positions of greater responsibility. current or next higher grade. c. SENIOR RATER. Overall performance. Part 1 of the form requires the NCO's basic personal information: their name, SSN, rank, contact information and the appropriate identifying rates and codes. Part 2, Box A requires the evaluating officer to provide their personal information needed for completing the form. Boxes B and С require the same information from any senior raters or reviewers who are also participating in the rating process. All reviewers and raters have to sign off the final evaluation report before sending it further. Parts 3 and 4 consist of a self-assessment. The NCO must provide their own take on their assigned responsibilities and appointed duties covered during the rated year, along with a description of any areas of special emphasis. Part 4 is for evaluating the NCO's service according to the Army's core values and beliefs. The task of the evaluating officer is to decide whether the NCO meets all of the Army's core values and to provide any additional comments about the evaluation. After providing an evaluation of the specific areas mentioned above, the evaluating officer and senior raters are asked to provide an overall assessment of the NCO's yearly performance in Part 5.